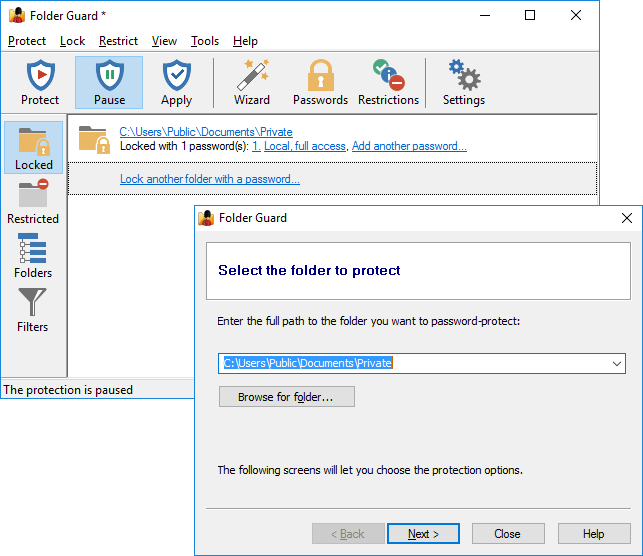 You can use Folder Guard software to protect folders with passwords. 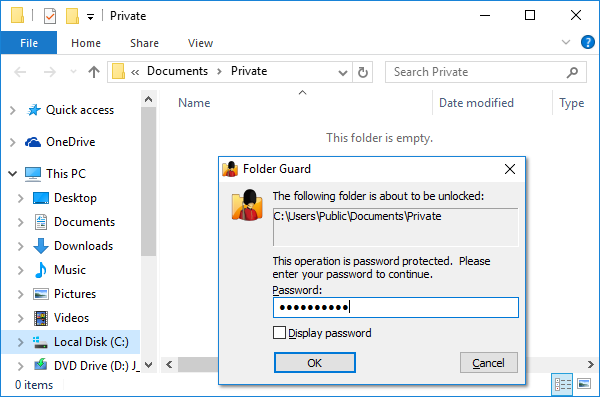 If you have entered the correct password, the folder should become unprotected and you should be able to work with the files and subfolders it contains without restrictions, as usual. However, if you don't enter the correct password, the folder will remain protected. Reply Yes, and the folder will be locked back with the password again, and will remain inaccessible until you enter the correct password again. You can direct Folder Guard to add the Lock and Unlock commands to the Windows shortcut menu. 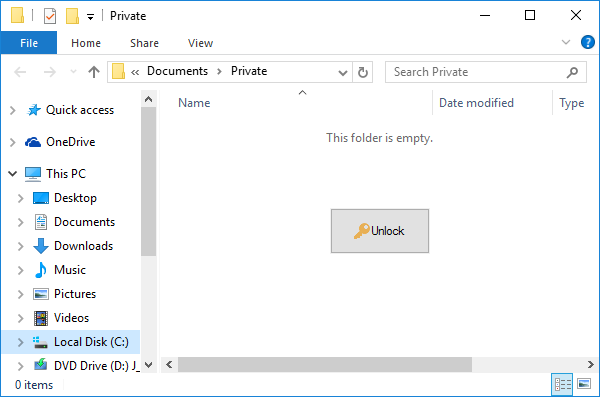 You can use them to lock and unlock the password-protected folders by right-clicking on them, instead of (or in addition to) double-clicking on the folders as described above. 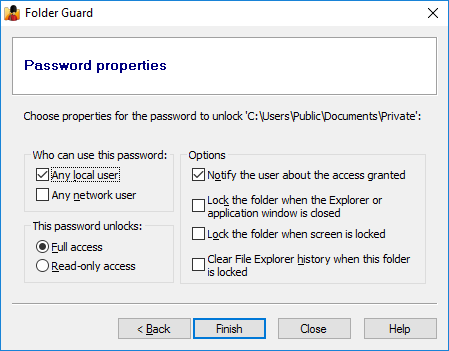 If you have locked many folders with passwords, you can make them all accessible at once by running Folder Guard and pausing the protection (you will need to enter your Master password, or course!) 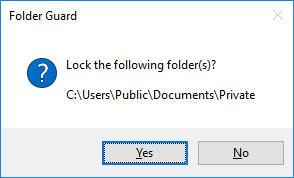 When you are done working with the protected folders, run Folder Guard and choose to resume the protection, to lock all folders at once with one click. 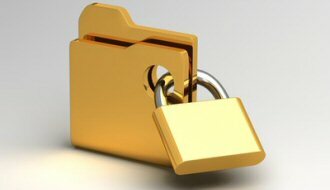 Instead of locking files and folders with passwords, your can completely hide them! And more! Please feel free to download the fully functional evaluation version and give it a try. If you don't like it, use Windows Control Panel to uninstall it: no strings attached. He has his files inside the external HDD, also!!! dimos: looks like USBCrypt is just the software for the task. You can use it to create an encrypted area on the external HD that takes only a portion of the whole HD (from example, a half of it). This way, you could put your own files in the encrypted area and they would be protected with your password. Your son could use the remaining unencrypted half of the drive for his files. 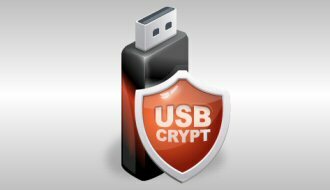 Please feel free to download USBCrypt and give it a try, to see how it could work for you (the evaluation version is fully functional!). Good luck! Its a very good software instead of others. We are currently using FolderGuard with our small network, to lock a few employee folders. Is it possible also to lock an outlook email folder? Any help would be appreciated if possible. Martin: Outlook stores the emails in a .pst file. If you restrict access to that file, you would restrict access to the Outlook data. You may also want to visit office.microsoft.com for information on protecting the Outlook data as suggested by Microsoft. That’s Great ! i wanna get in a software like this so long ! Pl advise how to buy this software and the conditions that apply. Will you give auto update and which all windows version this will support. R Muthukumar: to buy this software, click on the Purchase button. If you have questions, click on Help! Dear siddiq kathat: the trial version does not need a license key, it already comes with a built-in license for 30 days of the full use, free of charge. বিশাল সফটওয়্যার বানিয়েছ আমি সব ঢেকে রাখতে পারছি!!!!!!!! I have 15 folders I want to lock each folders by it own password I mean each folder is lock by its individual password, and other folder also locked individual password..
basudev sarkar: with Folder Guard you can create a separate password for each folder you want to protect. Please feel free to download the software and give it a try, it’s free and fully functional for the first 30 days. I forgot the password n geting no idea abt it now. Pls pls pls assist me what shud I do in dis case? @Neha: In order to help with this problem we need some additional information from you. Please get in touch with us using the Help – Contact us button on the top menu bar of this web page and we will try to help! What is nine minus 4 ?